Brighton and Twila start feuding over which of them is the most spectacular, casting the Mushroom Kingdom into a chaos of day and night. Mario and friends gather stars in another Mario Party to restore order to the skies. Four players hit a dice to move around the game board. 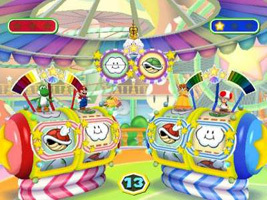 When all players have taken their turn, they are split into teams and a minigame battle begins where they compete for Coins. Coins can be used to purchase Stars or items. The player with the most Stars at the end of all the turns is the winner. The boards, events and minigames change depending on whether the sun or the moon is out. Some minigames are played with the microphone. When you visit the shops in the game, you can see GameCubes on the shelves.